It seems that 2017 has brought more discussion about whether a beef cattle operation should buy or bale hay than what I recall seeing in the past. The beauty of such a discussion is that there is no collective right answer; however, the considerations for an individual operation are numerous. 1) Grazed forage is cheaper than feeding baled forage. 2) There are profitable operations that buy all of their hay, and there are profitable operations that bale their own hay. 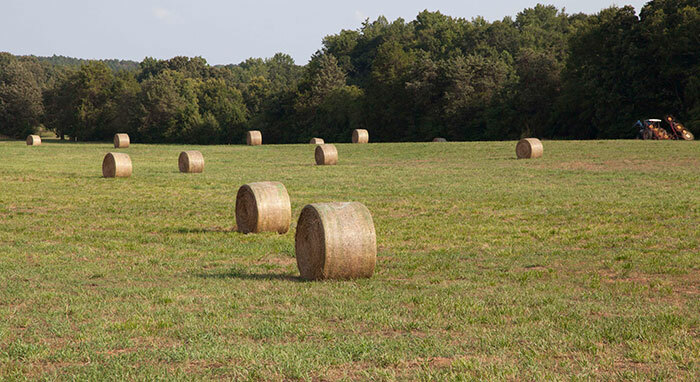 It’s the first fact that is the most relevant point to the buy or bale discussion — minimize the amount of baled hay needed regardless of how it’s obtained. In many cases, maximizing grazing days for the year has greater economic implications than whether you buy or bale your hay. The list of tools to accomplish this is well known to most cattle producers: rotational grazing, strip grazing, nitrogen fertilizer, stockpiling, and the strategic use of summer and winter annuals. This is where to start. As for buy or bale decisions, here are some thoughts and observations. For buying to be an option, there has to be a dependable source (preferably in relatively close proximity) who can deliver what you want and when you want it. Where this situation exists, buying hay may be an easy choice. If you feed growing and finishing cattle during the nongrazing months, just any hay won’t do. When asked, forage quality is one of the primary reasons I’m given for producing the farm or ranch’s own hay crop. More and more, hay is being stored as baleage to further enhance forage quality. With a growing number of grass-fed beef operations, legume-packed baleage is the winter feed of choice. This makes the list of capable hay suppliers much shorter. Finally, having to buy cheap, low-quality hay may cost more in animal performance and feed supplementation than making it yourself. It’s safe to say that cash flowing a line of hay equipment is easier on a large operation than a small one. But the need for winter hay is also governed by location and the success in minimizing nongrazing days. In the North, three or four months of nongrazing may be significant enough to easier justify a line of haymaking equipment compared to a Southern region where only one or two months of nongrazing exists. It usually only takes one time — one time of being promised something like a given amount or quality of hay by a certain time and not have it delivered. Getting burned by the hay supplier or a custom baler in a manner that costs significant extra dollars to remedy, or results in lost animal performance, is usually something that only happens once. That’s often when fire insurance is purchased in the form of haymaking equipment. It’s also these situations that never are accounted for in an economic analysis. Most grazing operations have their own acreage that will need to be baled, especially in the spring. Hiring a custom baler to harvest hay from your own land is something of a hybrid approach and may actually be the lowest cost option of the buy or bale discussion. Again, this assumes the custom baler can be depended upon to be there when you need them. You may or may not need to own a mower and rake. Let’s face it, people like to control their destiny and farmers are no different. It may be the number one reason why hay is often made rather than purchased on many farms, even the small ones. There’s a big difference in ownership costs between new and used equipment. For the savvy buyer who is also a good mechanic, machinery operating and fixed costs can be slashed to a minimum. That still may or may not be good enough. Ultimately, it’s the pastures and cows that will make the money. If making hay compromises the time and management needed for the cattle and their forage, then stay as far away from the baler as possible and find someone else willing and able to supply hay. In the past year alone, I’ve was told by one cattleman that selling the baler and buying hay was the best decision he ever made and by another that buying a baler (and wrapper) was the biggest “game changer” for his operation. Both had documenting evidence. This is clearly a decision that will continue to be debated and is very situation specific. Still, let’s not forget that minimizing nongrazing days will reduce the amount of hay needed no matter what the route was to the hay feeder.